The Poem Farm: Finding Poems in Moments of Surprise - And a Giveaway! Finding Poems in Moments of Surprise - And a Giveaway! Students - Sometimes as I go through my day, I notice something curious. Yesterday, I looked at the couch and saw Mini and Sarah...sharing! These two are not exactly pals, so it was a small ah-ha! moment for me, a bright moment of the afternoon. 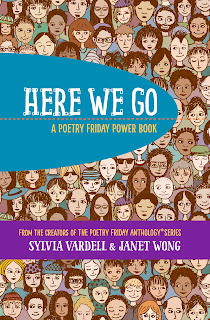 Today I am very happy to share the latest from Sylvia Vardell and Janet Wong...HERE WE GO! This book, like YOU JUST WAIT is a POETRY FRIDAY POWER BOOK, meaning that it is an interactive book full of mentor poems, places for young writers to play with words, and pages for poetry writing. This collection is very timely, addressing concerns that face many of our friends and neighbors right now. It is a warmly and whimsically illustrated volume focusing on social action and stepping up to make your own corner of the world a more loving place. And it's just full of poems, one each by Naomi Shihab Nye, Carole Boston Weatherford, Joseph Bruchac, David Bowles, Ibtisam Barakat, Eileen Spinelli, David L. Harrison, Kate Coombs, Robyn Hood Black, Michelle Heidenrich Barnes, Renée M. LaTulippe, Margaret Simon, and 24 poems by Janet Wong, threading the 36 poems into a story in different voices. 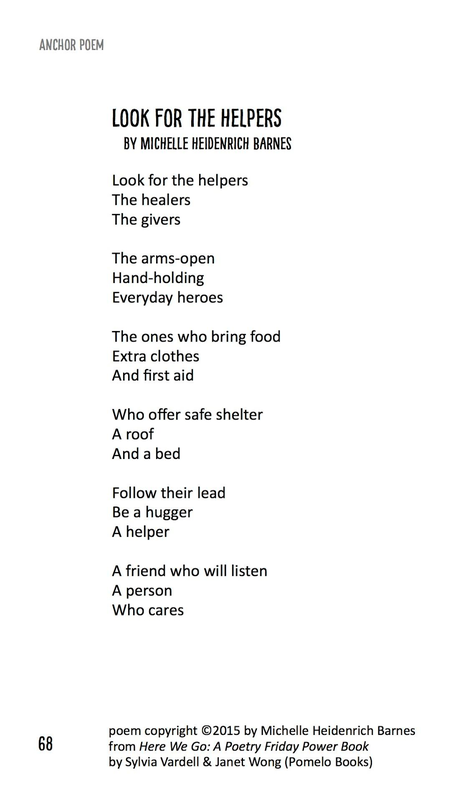 Here is a poem that is staying with me, one that helps me remember who I hope to be in hard times, by Michelle Heidenrich Barnes. This book shows how you go from having a spark of an idea to getting your community behind you, including the important step of thanking your supporters. The kids who read this book might want to start, as the kids in HERE WE GO do, with something simple like a food drive or walk-a-thon to raise money for the local food bank. Fighting hunger is something that anyone in any town can agree on, right? And any school district, too: because if your students don’t have healthy food, they can’t concentrate. Fighting hunger = better learning! 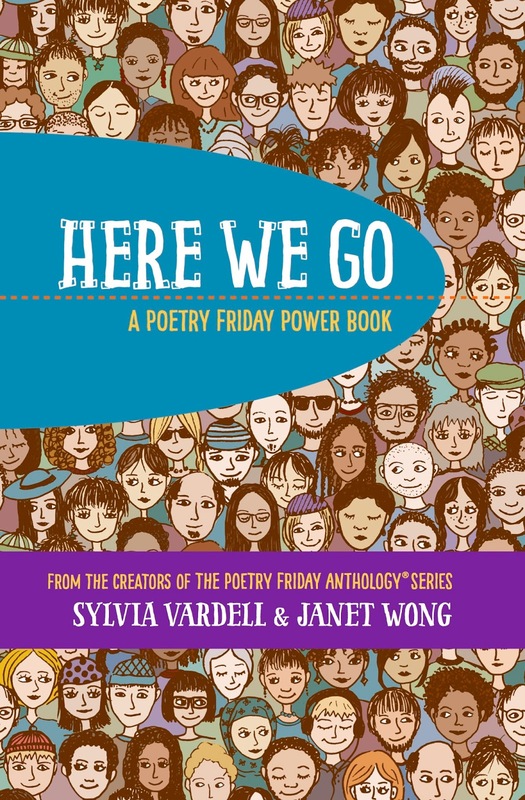 Janet and Sylvia have generously offered to send 5 copies of HERE WE GO to one winner, someone who comments on this blog post by next Thursday evening, February 23. If you win, please give the books to a group: book club group, or home school group, or other group of students who will enjoy reading and writing on its pages. Jone is hosting this week's Poetry Friday roundup over at Check it Out. Head over there for poems, ideas, and community. We are a welcoming community....and we welcome you! Planning for our upcoming poetry unit and this book looks great! Thanks so much for tooting the horn for HERE WE GO. We appreciate your support so much! And I love how you caught your two cats being surprisingly friendly. There's hope for us all! Oh, I love the picture of your cats sharing the couch. Makes me think about how we need to sit on the same couch together to solve some of the world's problems. And I love that Sylvia and Janet's new book focuses on social justice. Their timing is impeccable. I would love to share this book with my after school book club. Janet and Sylvia are so incredibly generous! They spread the love of poetry everywhere they go. I am so happy to be a small part of this amazing project. Once again, I love how you've captures the cat-friendly moment in your poem today. A wonderful poem by Michelle, and I love your cat-insight poem. :-) Here We Go has such a good vibe. Our cats are not friends, either, but they do peacefully share the same porch in the summer. Michelle's poem is an important reminder that we all need to be helpers these days. Thank you for sharing it today, Amy! Hi Amy! Love that your cats found some common ground--on your couch! I am in the midst of planning our whole school poetry month festivities. Here We Go looks like it might be a great resource for us! Sending you warm wishes! Nice also to hear also that even Mini and Sarah are giving kindness a go. Maybe there will come a time (soon) that the whole country starts to feel that way. We can hope! Ha! Love this poetic tale of persnickety kitty-ness; just came from a feline post over at Jane's, too! And Michelle's poem is a favorite, perfect and timeless for us humans. Thanks for sharing all; don't count me in the drawing, as I'll be doing a give-away myself in two weeks, thanks to the generosity of Janet & Sylvia! I wonder, as I read your poem, if this sitting on the couch together might open up possibilities of the two becoming friends. I have read several posts about HERE WE GO today. I want to go online and order it. I would love to win these books for our homeschool co-op. There are exactly five kids in it! We have been doing poetry all year, and the kids really love it. We are so grateful for your support, Amy. Thanks as always. BTW, I just love how you always include audio recordings of poem readings too. That is such a great idea and so useful for kids and teachers. Modeling, modeling, modeling. You rock!